Beyond full-text search: from semantic search to knowledge mining! 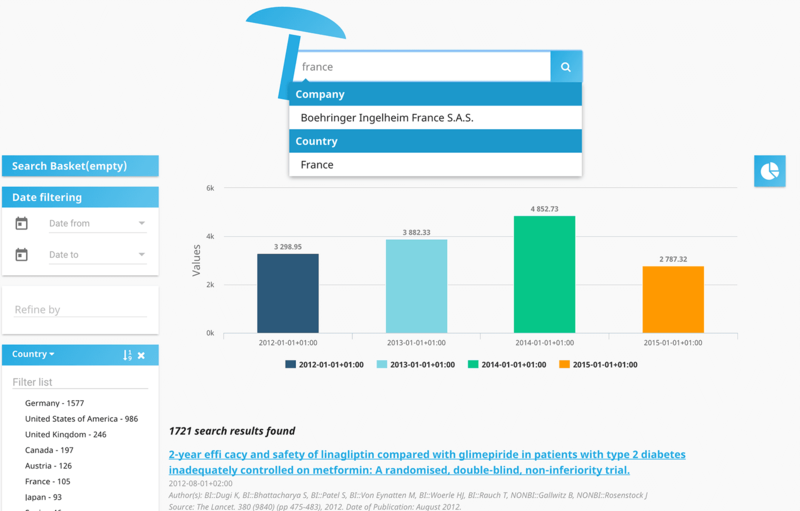 Semantic search at the highest level: PoolParty GraphSearch Server combines the power of graph databases and SPARQL engines with features of ‘traditional’ search engines like Solr or Elastic Search. 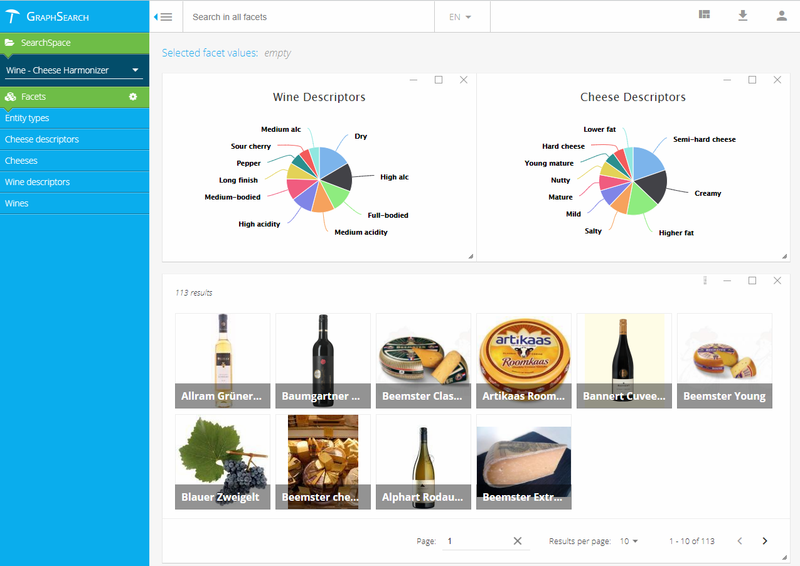 Document search and visual analytics: benefit from additional insights through interactive visualizations of reports and search results – derived from your data lake by executing sophisticated SPARQL queries. Data linking: GraphSearch can be based on various linked knowledge graphs, created by automatic data transformation, extracted from databases or custom tailored by taxonomists. GraphSearch API: create and configure your own search and analytics application – based on a management system for SPARQL facet queries and RDF visualizations. GraphSearch WebApp: based on Spring, you can customize your GraphSearch WebApp for your own needs. UnifiedViews: GraphSearch is based on scalable RDF graph stores and linked data. 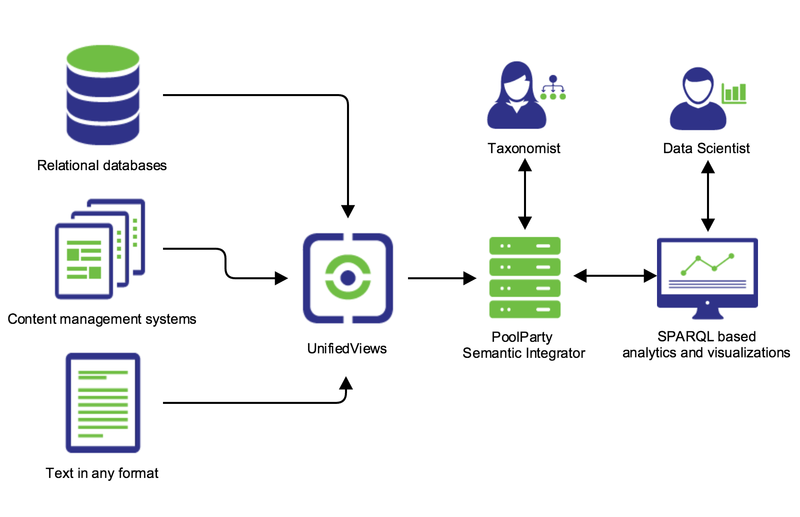 You can gather them from various sources by using UnifiedViews and/or by transforming documents into RDF by means of PoolParty Extractor. Apache Solr: benefit from Solr with extended semantic capabilities and most precise faceted search. ElasticSearch: extend your Elasticsearch with taxonomies and more precise semantic indexing – including better support for multilinguality and similarity search. Marklogic: autocomplete, hierarchical faceted search, semantic enrichment of document index, precise similarity search, and contextual enrichment of search terms (online demo here) – all based on your enterprise knowledge graph. Stardog: combine capabilities of a state-of-the-art RDF Graph Database with semantic search features. Virtuoso: rich data analytics and BI applications, based on integrated views over structured and unstructured information and extensive knowledge graphs. GraphDB: holistic 360-degree views on business entities and their relationships, mapped with a high level of detail.